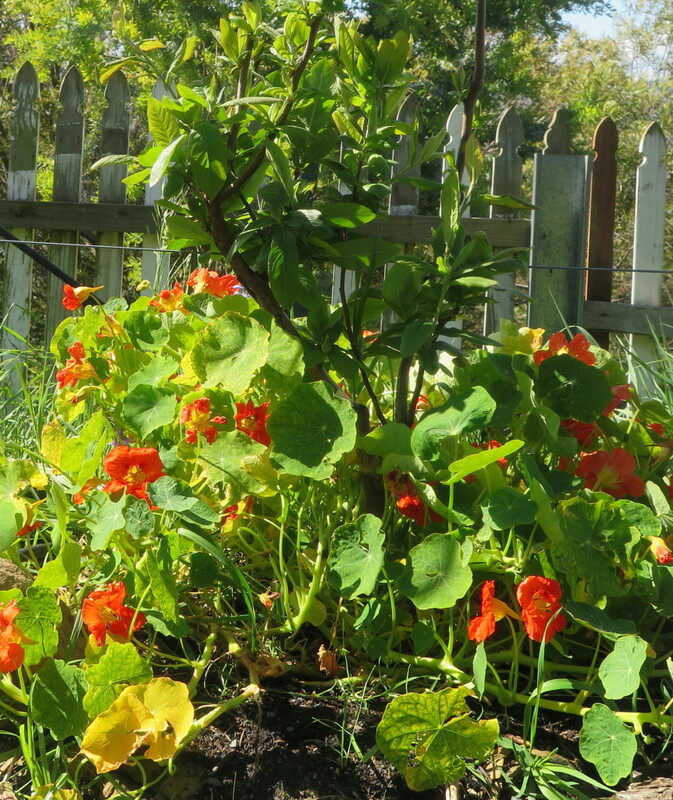 In our cool temperate climate, we make a point of not mulching our annual garden beds over winter as the soil’s so cold we want the sun to be able to hit it directly – warming it up as much as possible. Plus, mulching in winter creates the perfect habitat for slugs that’ll ravish your plants. However, come summer time we’ll happily mulch our annual crops to prevent evaporation, slow down any weeds and provide organic matter for our soil food web. 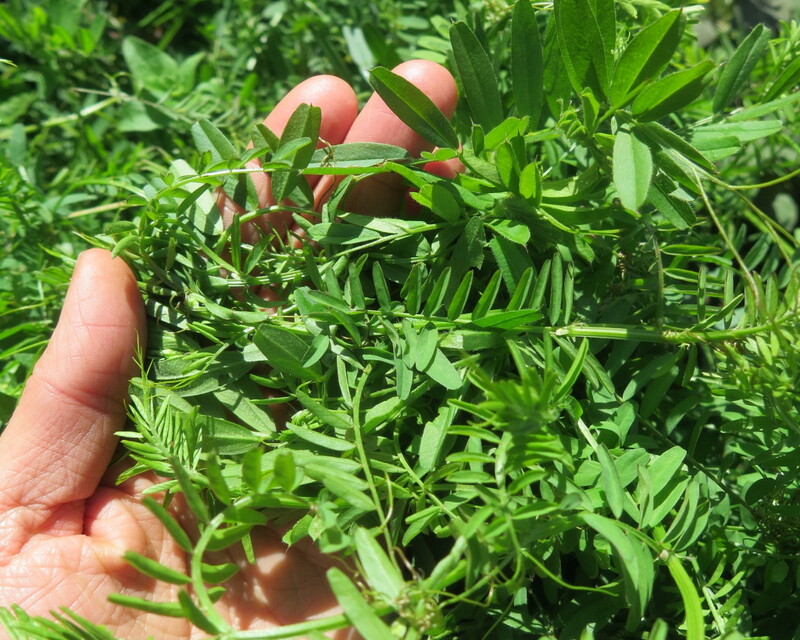 Vetch (Vicia sativa) is a nitrogen-fixing ground cover that (to our delight) actually volunteered in our garden. We foster it in our herb garden where it fills in any gaps between plants and adds to the colour of the area with its purple flowers (not flowering at the moment). We’re big fans of comfrey (Symphytum) and plant it amongst our orchards and globe artichoke patch where it also helps stabilise the slope. It’s deep tap root can “mine” minerals into its leaves which we then chop and drop beneath our fruit trees where they release these minerals into the top layers of the soil. 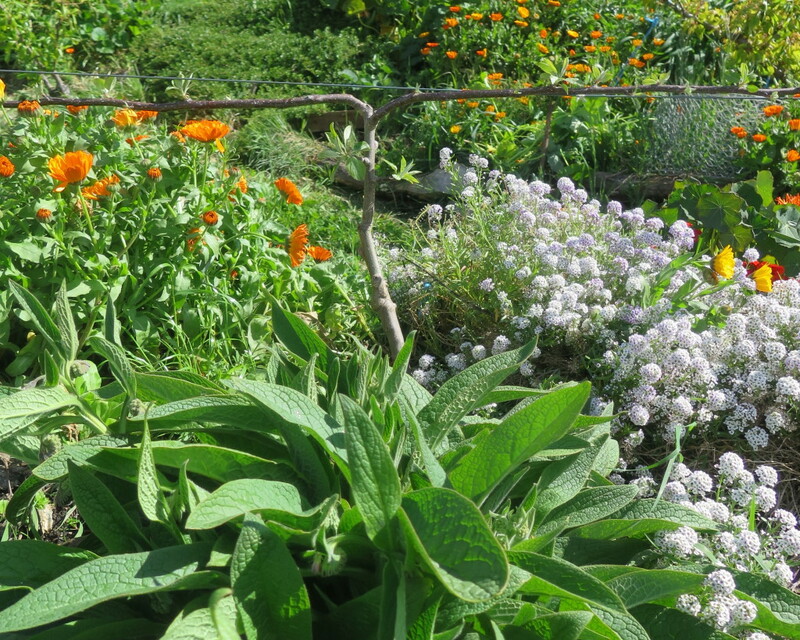 We’ve written extensively about comfrey and its uses – see our past blogs and photos here. 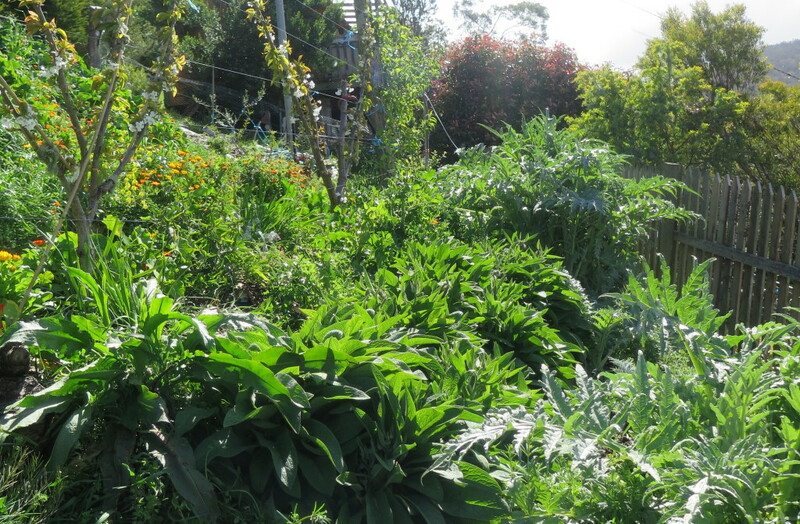 Comfrey helping to stabilise our slope and acting as a living mulch for our globe artichokes and fruit trees. 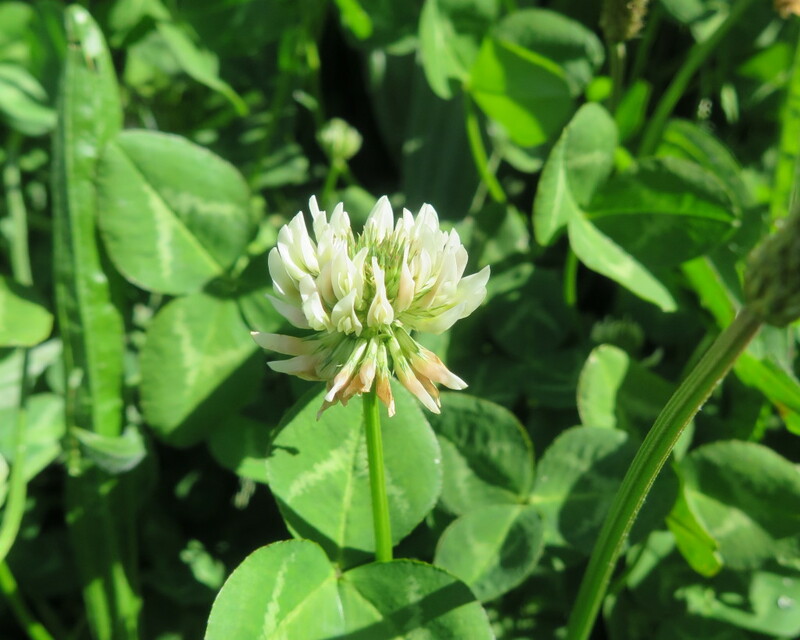 We use white clover (Trifolium repens) throughout our small edible forest garden. This quick growing, nitrogen-fixing ground cover is super hardy and popular amongst the honey bees. They’ll flock to the flowers, which of course ensure the fruit trees nearby benefit from pollination. FYI – never plant this in your annual veggie patch as it’ll become invasive and you’ll never get rid of it! Easy on the eye and a hot spot for the bees, a mixed floral living mulch system is a great way to go for both the soil and often your tummy. A lot of these flowers are edible, including the nasturtium and calendula flowers – add these to your salads (and more) and you’ll end up eating rainbow dishes! 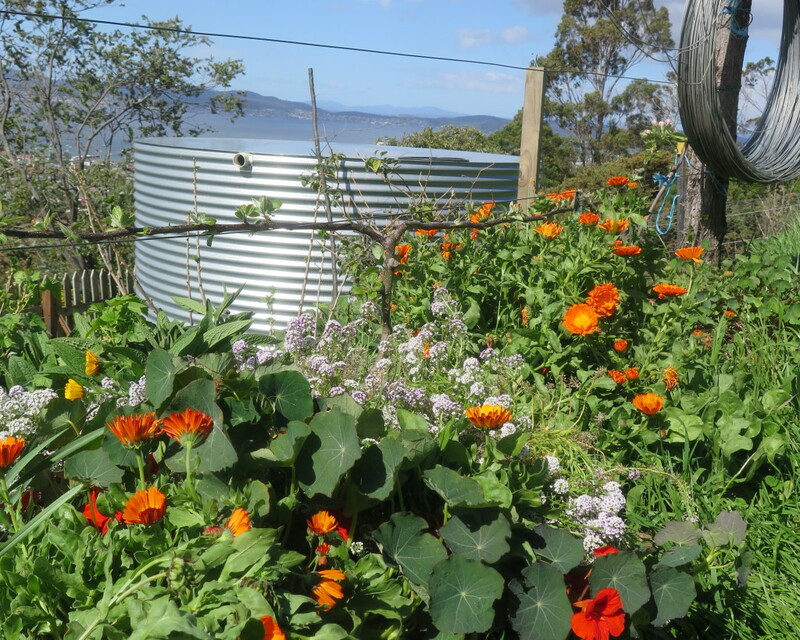 We use nasturtium (Tropaeolum), sweet alyssum (Lobularia maritima) and calendula (Calendula officinalis) as our main living mulch options as they self seed *prolifically*, are tough and the bees love them. We’re big fans of plants that can handle the ‘tough love’ approach to gardening. You wont fine anything that needs constant pampering on our property – we’re all about minimal input and maximum output. * Please excuse the rain tank’s overflow pipe not being connected to anything (yet). We’re in the process of connecting it into an overflow system that will pipe it through our orchard (to its benefit) with all excess water then going into the storm water drain. 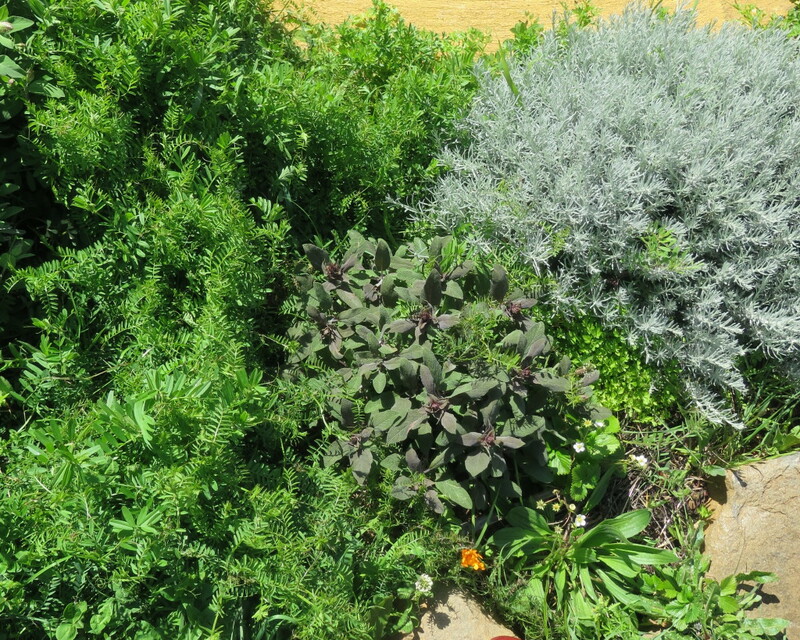 What about native plants as living mulches? Good question. 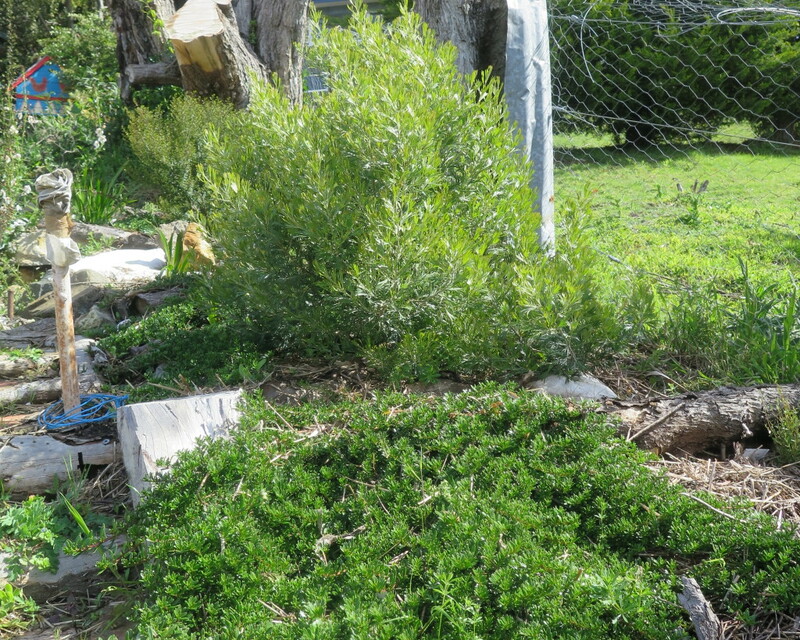 We currently have two native plants we use in our garden as living mulches – the creeping boobialla (Myoporum parvifolium) beneath our young grevilleas and tea trees and creeping saltbush (Rhagodia spinescens) which we’ve planted beneath our young olives – this last one is recognised as a local bush tucker plant as well. Creeping boobialla (Myoporum parvifolium) smothers out grass beneath a young grevillea. The boobialla grows incredibly close to the ground, while this particular variety of salt bush will grow to around 30cm before spreading out – they’re both beautiful and vigorous plants. Obviously there are many more plant options available to you depending on your climate and context. The key thing to aim for is to choose plants that benefit, rather than compete with one another. As a general rule, most ground cover plants will have shallow root systems, meaning they’ll be suitable as a living mulch around fruit trees or larger plants that generally have a deeper root system. At the end of the day, maintaining bare soil in your perennial crops is a lot of work (think weeding and watering). Why bother when you can grow a living mulch – the benefits are many and while it still requires input from you, it’s significantly less and the rewards and more! We have a small lawn with some white clover in it which I was leaving for nitrogen and bees but now after reading this I’m worried it might take over? I second your advice not to put white clover in the veggie patch, oh the regret! 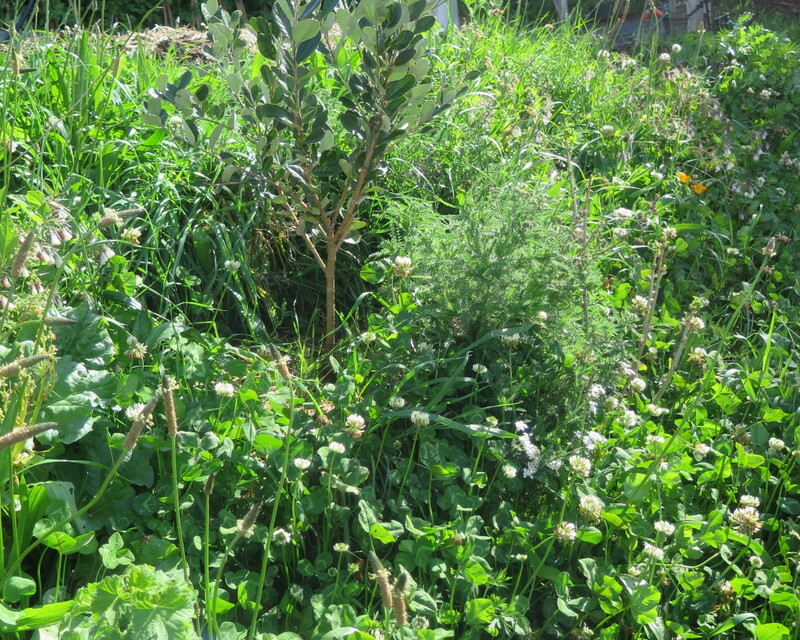 But live and learn, I am now experimenting with red clover to improve the drought tolerance of our small patch of lawn. Quite impressed so far, as the flowers are tall which means that it can be mown to discourage bees from the lawn when we want to use it, and let it go a bit wild and meadowy when we don’t. Talk to your local garden clubs/networks to find the right flowers you’re looking for :-). I knew a family about 2 decades ago in Brisbane, who used strawberries as a living mulch in all their perennial gardens. They let the strawberries grow too thickly for the best yield, but there were so many plants that there were still ample strawberries when they fruited. Love this article. I have used living mulches in the past and now that we have moved I will be looking to do some more living mulching (is that an actual term?) in our new garden. 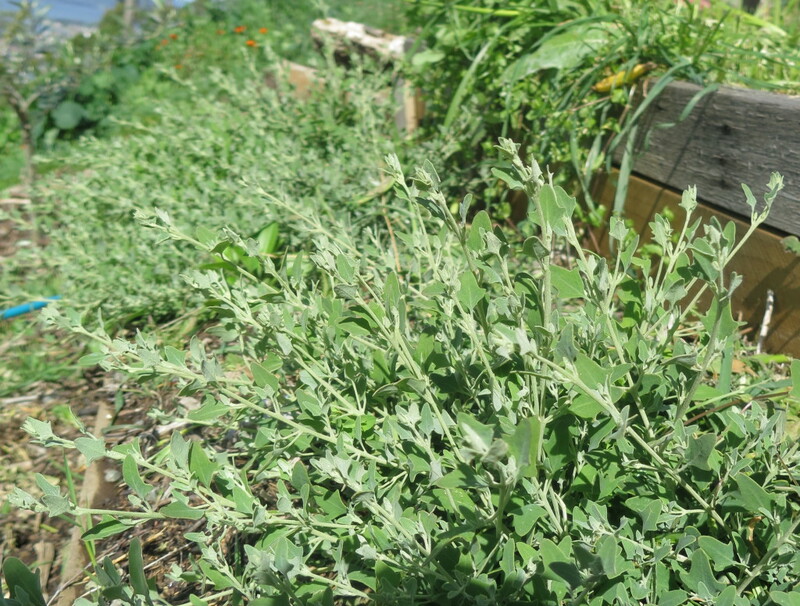 I also add 2 different varieties of lucerne to the mix which seems to work well. Plus I tip in 3 types of clover. Sounds good Tracey :-). And sure, living mulching can be a term!